I hope that Stephen Fry will also cover the need for an international language in his BBC 2 series, And that won’t be Klingon! Esperanto however would be a worthy candidate. Many ignorant people describe Esperanto as “failed” – other ignorant people say that if human beings were meant to fly, God would have given them wings. Esperanto is neither artificial nor a failure however. As the British Government now employs Esperanto translators it has ceased to be a hobby. I think you mean ‘canon’. I was looking forward to this but it was so condescending an half-arsed that I had no option but to fall asleep. Generally you need to switch off half the brain to watch any BBC documentary. 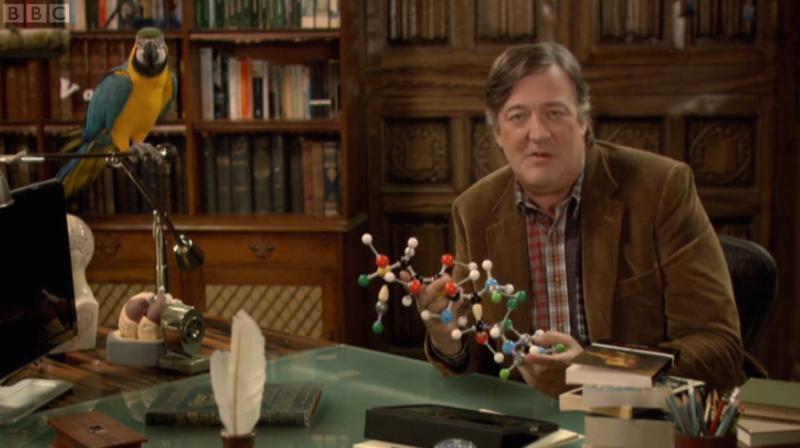 @John Carr: Yes, that’s exactly the kind of mistake Stephen Fry would never make, maybe I should be fired. Although it wasn’t terribly taxing, at least Fry is asking the right questions in an accessible way. The Horizon documentary made the field look like a clandestine organisation. Hmm, having seen the documentary again, I was perhaps a bit too kind. Here’s a more rigorous run-down from bad linguistics. In Planet Word last night the gentlemen in the golf club bar in Connemara might have answered more instructively when asked about the differences in ways of saying things in Irish and English. Irish is rich in words and expressions that cover personal interaction and attitudes to that interaction. These often suggest the Irish were an ironic people even before they started speaking English. A short list below is made up of Irish words still used in everyday speech by English speakers in Waterford, the county which has the smallest remaining Irish-speaking area. Most counties have no such area. Trína chéile (‘treenakayla’) = literally ‘between together’, this means a state of inability to interact with oneself, which is something more than confused. I recognise some of those words- my family uses ‘Flaithiúlach’ in a fairly disparaging sense. Perhaps Fry’s thesis (“Language defines us”) does not take into account how much language has adapted to our social needs. Perhaps instead of defining us, language reflects the social actions we find important in the world. ráiméis (‘rawmaysh’): the kind of rambling or raving drivel characterised by the true interest the speaker has in listening to what he or she is saying, drunk or not, senile or not. cnáimhseáil (‘cnawvshawl’): the complaining done by a whinger, like rubbing bones together (cnámh being the Irish for bone). A much more rigorous analysis of the second program, by Manuela Rocchi. Next Next post: Does a Smart Phone make Smart Science?